With all the new construction going up in China, it’s easy to lose track of “one more cool-looking” building. But PTW’s National Swimming Center for the 2008 Olympics in Beijing exemplifies what all this new construction should aim to be: beautiful, functional, forward-thinking, and most importantly, a good example for future development in a nation whose growth appears to know no bounds. The design, which won a competition in 2003 and will sit adjacent to Herzog and DeMeuron’s main stadium, boasts a striking blue “bubble” aesthetic, which is both eye-catching and indicative of the function it houses (we love this interior-exterior architectural connection). Known as the “Watercube,” PTW’s design is a basic box, juxtaposed with an organic “bubble” structure that makes up the building cladding. The bubbles are both organic (in form) and highly-scientific, constructed based on actual arrangement of organic cells and the natural formation of soap bubbles. “Our ‘Watercube’ concept is a simple and concise square form that ultimately uses the water bubble theory to create the structure and building cladding, and which makes the design so unique. It appears random and playful like a natural system, yet is mathematically very rigorous and repetitious. The transparency of water, with the mystery of the bubble system, engages those both inside and out of the structure to consider their own experiences with water,” says Andrew Frost, Director of Sydney-based design firm PTW. The skin’s material is just as innovative, its structural properties made possible by a lightweight and transparent Teflon called ETFE. The particular species of Teflon is designed to react to changing light conditions, which will create stunning visual effects for both visitors to the Watercube and to millions of TV spectators. And if you’re wondering about the green-ness of the 7,000 square foot Watercube, PTW has brought in Arup, the highly-respected engineering firm to make the structure as efficient as possible. “Swimming centres require a lot of heating, but by cladding the building in high-tech ETFE cushions, we have developed a very efficient green house. 90% of the solar energy falling on the building is trapped within the structural zone and is used to heat the pools and the interior area,” says Kenneth Ma of Arup. For more details on Arup’s sustainability studies, visit their website here. is this pool open to the public. Chinese are great in swimming. I want to try swimming workouts here with the most great swimmers in town. wow it looks really good but wanted to see the plannin of this structure...can someone help? I have seen the pool design on tv, in the game when Mr Phelps won his gold medels, and the T.V. 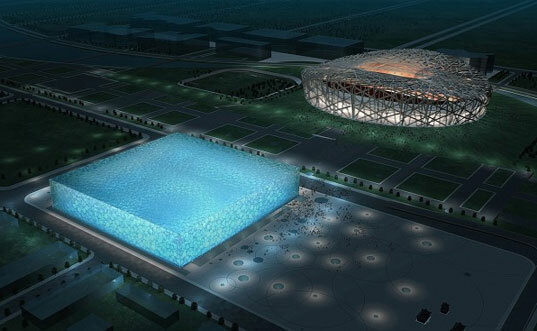 show "Beijing’s Olympic Swimming Pool". I love it. Is it going to be open to the public after the Games? Im pretty sure people from around the world would want to swim there. inculding me!!!! Will this pool be open to the public after the games? I so Want to swimming in it!!!! i like it but its as always a piece of chinese propaganda the building has already been filled with pollution and the bubbles are looking a little gritty and the olympic games havent begun yet they do in 3 hours hi from australia!!! meant to say 'questions'....!!! how silly of me..couple too many beers...!!! yes all, it is amazing. a mega structure.15,000 people inside. it makes it's own heat and cooling systems automaticaly. it's all in the covering, the skin. fairly amazing. i hope many world records are acheived in this pool without influence. looks very much like our friendly neighbours have acheived a way of attracting attention for a long time to come. if i need a pool hall built , i know where to start asking quetions....!!!!! This is a very cool design. Makes you want to go swimming. At least from the outside! For all of you with questions about the chlorine---- For sanitation, it will use very little chlorine. Instead, it will rely on a combination of filtration types: zeolite, course sand, aeration, high capacity UV disinfection and only a small amount of chlorine for residual. This should do a good job of removing environmental toxins such as silver, mercury, cobalt and arsenic. A good idea given environmental toxicity concerns. The UV will be a treat for U.S. swimmers as it does not have the reactivity of chlorine with ammonias and various human organic substances that form trihalomethanes and other respiratory irritants. In closed natatoriums that problem tends to be compounded. So, the system they have used should do the trick. Ann Haiden, D.O. Just walk away! well done chinese people you are far better than the greeks at building olympic buildings!! You guys keep mentioning 3D model. Where? I don't see it. Is there a link to that? Richie, if the pool is functioning correctly, there should not actually be any chlorine fumes in the area. You can only smell chlorine in the air when a pool is not properly balanced. For those questions about fire safety of ETFE, there is a document at http://www.arup.com/australasia/feature.cfm?pageid=3778 about that. Protecting 'The Water Cube' Fire Engineering’s Crucial Role Without Arup’s fire engineers, the Water Cube’s structure as we know it could not have been used as the National Aquatics Centre for the 2008 Beijing Olympics. After the innovative design was voted the winner of an international competition judged by the people of China, the challenge for Arup Fire and the design team was to demonstrate that the design provided for an acceptable level of safety. 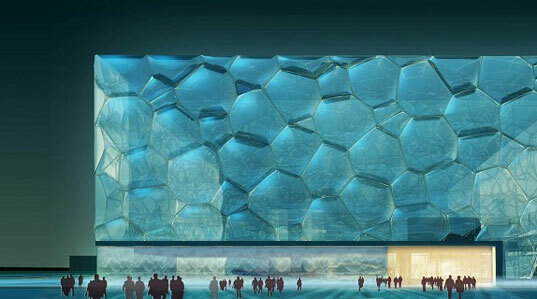 As the Water Cube did not follow the prescriptive rules of the Chinese Building Code, this involved complex analysis, the use of research data, detailed reporting, and presentations to the Chinese authorities. The fire engineering design received formal approval in early 2004. It is the first Olympic site in Beijing to receive approval for the fire engineering, and has set a precedent and direction for future Olympic projects in the area. The Innovative Facade - ETFE ETFE, the innovative material being used as the 'skin' of the Water Cube, is an amazing material with excellent insulation properties, however it is combustible. As the Chinese Building Code does not allow for the use of combustible materials for façades, Arup Fire needed to address concerns about its performance in fire, the potential fire scenarios, and the consequences for safety. This allowed the development of appropriate criteria for material selection to provide an acceptable level of safety. The greatest attribute of ETFE in fire is that is shrinks away from a fire, thus effectively ‘self-venting’ and letting smoke out of the building. Keeping People Safe It is estimated that 20,000 people, including spectators, athletes, officials and support crews will use the Water Cube at any one time during the Olympics. To cater for these numbers, the Chinese Building Code would have required 200 metres of exit doors, the equivalent of two sides of the building. Not only would this have significantly impacted on the architectural look of the Water Cube, it would have been a security issue. Knowing that people prefer to enter and exit from the same place, the fire design encompasses open circulation routes rather than enclosed circulation routes, and incorporates appropriate fire safety systems like sprinklers and smoke exhaust. This makes the building safer for longer and allows the more open and familiar circulation routes to be used for egress. The egress and circulation routes were specifically designed to maximise net lettable area, provide pleasant and efficient open circulation routes, and minimise external doors adversely affecting the external architecture. The fire engineering has delivered the best of both worlds. The Water Cube retains its architectural integrity and is a magnificent venue for users, all within an environment that leads in fire safety performance. Whatever the Chinese do it is always grand and beautiful. This will become a legendary building anyway. Looking forward having a look this summer.. Your Walmart/Nike/etc. dollars at work! Natitoriums require high HVAC airlfow on the skin of the building to combat the effect of condensaition. How has that issue been adressed in this design? Notably missing from these images is the particulate soup that comprises Beijing's air. A person returning home after just an hour or so out of doors will blacken a face towel with the dirt collected on their skin. Even in China, there is simply not enough labor available to keep the bubbles as shiny and brilliantly inspired as they look in these images. Even more than vertical, opaque surfaces, the pollution on these bubbles will be very hard to miss and is likely to have a substantial effect on the amount of sunlight that penetrates into the interior. Kudos to Arup for their energy considerations, but this design will not be as blue or radiant as in the drawings for many years to come. If ARUP are working on it I'm pretty sure they'll have covered all of the concerns... As for glass-crete, it's in development as far as I'm aware, still a few years off. Cool looking... but what about air exchange ? If there are no standard windows, as 'backup's at least, if the air handling systems go off line for whatever reason... the buildup of chlorine fumes would be a problem. I think islamic Fundamentalists recently blew up a chlorine gas truck and made a lot of people seriously ill, or dead, as a result. Pool buildings require redunant fresh air circulating systems. From the design pictured... it does not appear that this is the case. Isn't Teflon a posionous substance if burned ? Is this Teflon product fireproof ? At what temperature will it ignite ? Isn't there a fellow in Houstoin who developed 'Glass Crete' ? Maybe a better design would have incorporated this new materia along with other materials as the skin ? Also... having opaque teflon pillows all around, and thereby not allowing a clear view in or out of the building, doesn't work for me. I hope my concerns are unfounded, as this building is well on its way to being finished. judging by the sandwich appearance I bet there isn't any glare--probably has more a kalwall diffusion through the layering. I'm wondering if it really has this blue tint or if that's the pool bottom color reflecting to the outside--since the other rendering of the inside shows it as white--from the sunlight? Seems like this form had to get some help from the Fuller geodesics but taken to a different place. Love the whole effect--like a giant ice cube. is this a pool of water in a standing glass structure? God, I LOVE it. The views from inside are particularly interesting too. I wonder though-- what's the sunlight glare like in this type of building? In some sports like Water Polo, glare can be an important advantage/disadvantage. Oh well, can't wait to see it in action! Popular Science had an article about this in their December 2006 issue. Among other things, according to the article it uses steel pipes linked together by 12,000 load-bearing nodes. The nodes distribute the weight of the building and make it strong enough to withstand Beijing's most severe earthquakes. It is beautiful. I don't usually admire building design (even the sleek shiny ones) but this is gorgeous. I really have no idea about the genuine energy consumption of this design (although it sounds better than you'd expect, with swimming pools providing a HUGE energy drain from what I'm aware), but purely aesthetically this building is STUNNING. With all the new construction going up in China, it's easy to lose track of "one more cool-looking" building. But PTW's National Swimming Center for the 2008 Olympics in Beijing exemplifies what all this new construction should aim to be: beautiful, functional, forward-thinking, and most importantly, a good example for future development in a nation whose growth appears to know no bounds. The design, which won a competition in 2003 and will sit adjacent to Herzog and DeMeuron's main stadium, boasts a striking blue "bubble" aesthetic, which is both eye-catching and indicative of the function it houses (we love this interior-exterior architectural connection).